Some of the achievements to date under the Team Unity administration. 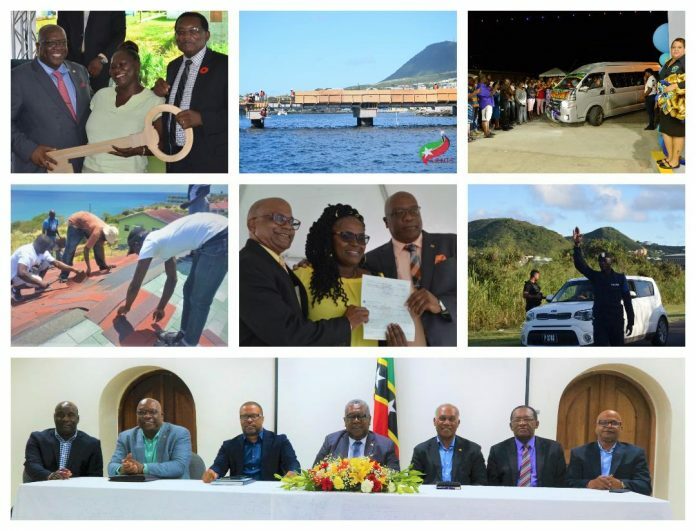 BASSETERRE, St. Kitts –- The latest national poll conducted by Jamaican pollster, Don Anderson and his Market Research Services Limited team, indicate the majority of people in St. Kitts and Nevis favour the Team Unity administration and its policies and programmes, according to Prime Minister Dr. the Honourable Timothy Harris. The national poll was conducted last year, between Nov. 15 and Dec. 10, and covered all 11 constituencies in St. Kitts and Nevis. Anderson questioned 869 persons aged 18-years and over, who are eligible to vote in national elections. An article posted in the Jamaica Observer stated that Anderson reported 57 per cent of the persons interviewed thought that things have got better in the country over the last three years. “This is a very strong, positive assessment of the current situation in the country. This far outweighs the 23 per cent who feel that things have got worse over this time. This positive view of the way things are going in the country was echoed across most of the constituencies, including some held by the Opposition,” Anderson was quoted in the article as saying. On the performance of the government, Anderson said more persons rated the Team Unity administration positively than those who rated it negatively. When asked how they would rate the performance of the Dr. Timothy Harris-led Unity Government, 38 percent viewed this positively, rating it very good or good, compared to the 30 per cent who rated the performance as being poor or very poor. “At the same time, another 32 percent considered the performance as being acceptable, if not in the strongly positive category. In the final analysis, close to 70 percent of all persons interviewed regard the performance of the government as being average to excellent,” Anderson further stated in his report. Speaking at the Feb. 18 town hall meeting at the St. Paul’s Anglican Church Hall, Prime Minister Harris made reference to an “interesting finding” of the poll, which stated where persons were asked to indicate what factors conditioned a negative rating of the government, the largest single mention was ‘I don’t know,’ represented by 14 percent. The survey also found that a significant number of individuals acknowledged, “The government is making coordinated efforts to tackle crime and violence” in the country. The majority of people interviewed welcomed the deployment of the Regional Security System (RSS), as well as efforts already in place to review the strategic programmes of the National Security Strategy Commission. The poll also showed that the majority of residents questioned were in favour of the government’s decision to implement its Poverty Alleviation Programme and its move to put mechanisms in place to monitor how recipients use these funds. When asked about the real accomplishments of the Team Unity Government that helped to shape their positive views, 43 percent felt the government improved the infrastructure, 23 percent said the Government had provided roofing assistance; 14 per cent cited the move to provide affordable housing; and 10 percent pointed to the introduction of the Poverty Alleviation Programme.